You might have already discussed this book in your book clubs. This is one of the most talked about memoir and I may not be telling anything new in this review but I cannot not write about this amazing book. Angela’s Ashes is written and narrated by Frank McCourt, Irish-American author, about his childhood and hardship of growing up in Ireland in poverty. When Frank’s father is unable to get an employment in Brooklyn, they move back to Angela’s native village in Limerick. Their situation worsens in Ireland. McCourt family consists of father McCourt who can’t stop drinking away all the welfare money. His brothers and the mother are other members. The best part of the book remains the humor in the times of sorrow. In the each statement, in each paragraph you can sense the point of view of the child. Like he describes the ground of of their apartment is called Ireland because it is always flooded while the upperlevel is called Italy because it is warmer and pleasant. However this book was published long after Mr McCourt had lived those days and he had been accused of exaggerating his miseries. But I believe no great piece of literature is spared from criticism. It was later adopted as major motion picture. 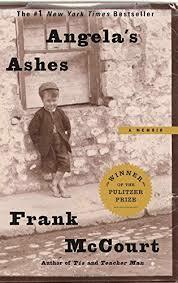 I rated Angela’s Ashes by Frank McCourt 5 out of 5 stars in goodreads. This is one memoir that can change your views on the genre itself.